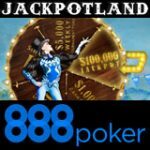 Jackpotland Tournaments returns to 888poker and runs until the end of December 2017. 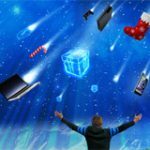 Players can win up to $100,000 in cash for each day of the promotion. Win cash and prizes in the daily Jackpotland tournaments or spin the jackpot wheel daily to win guaranteed prizes every spin during the promotional dates. Signup as a new player and get free tournament tickets for the promotion, players can also claim tickets by making a deposit or spinning the jackpot wheel. 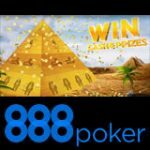 Download 888poker or get the 888 poker app for your mobile device! Double your first deposit up to $400. 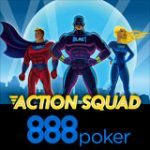 Join in on all the action with the latest 888poker promotion where players can win up to $100,000 every day. 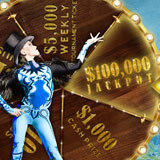 There are four daily $3000 Jackpotland tournaments and a weekly $5000 Jumbo Tournament every Sunday. Complete the daily challenges to win tournament tickets or spin the daily jackpot wheel to win guaranteed prizes which include: tickets, bonuses and up to $100,000 in cash. 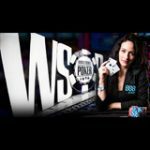 Play the daily Jackpotland tournaments on 888poker, players can use their tournament tickets to play in any of the four daily $3000 tournaments. 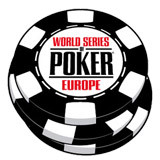 The skills tournament is a regular online poker tournament and the lucky tournament is an all-in tournament, no poker skills required. Cash Games - win fifteen poker hands on the cash game tables at stakes of 2¢/5¢ or more. Flopomania - play at least 40 poker hands of Flopomania cash game that have antes of 5¢ or higher. Players can claim a maximum of four tournament tickets per day, one ticket for each of the challenges. Only real money players that have made a deposit will be eligible to complete the challenges.